It was refreshing to sit down at an actual drum set this time around after trying get by with nothing but air a few days ago. After jamming out to a few songs with them, I have to say these are better than the original four-head Rock Band drum set. Now, that's not to say the RB2 or Guitar Hero sets won't better (and they probably will), but I like the setup of these drum heads much better. 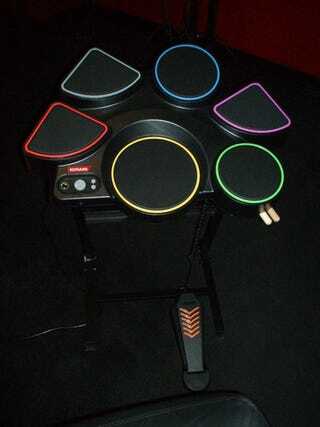 It's too bad, however, the actual game makes drumming on this particular set very frustrating.For the drum set itself, it's really nice and sturdy. You can store the sticks right into the side, and the pedal is solid and has some weight to it. What I like the most is how the yellow snare head is sort of in the middle and much larger than the other ones. It's the head you'll be hitting most and it fits more naturally right in front of you like a real set. The other heads are positioned correctly as well, but I'm not really feeling how the cymbals aren't floating like they should be. It's makes it a bit hard to focus on the notes when you might end up missing the cymbals all together since they're small. But these are minor complaints compared to the gameplay. Rock Revolution's notes don't cascade toward you at an angle like in the other games. I never gave it much thought until now, but this just does not work, especially on higher difficulties. It doesn't allow you to get a sneak peak at upcoming notes since your eyes are so focused on the bottom. This leads me to the next problem. The drum heads, are not lined up to the heads on the screen, and the drum pedal has it's own note head rather than the scrolling line we've come to love in Rock Band. Trying to get this to work with the rest of the notes on screen is super frustrating. Also, this game is tough on when you hit the notes. There's also no room to breath at all on the notes, either. If you're even slightly off, you'll miss the note. All that being said, I dug the drums. I'm curious to see how the new drum sets from RB and GH compare to them. The rubber heads had a good bounce to them and the pedal was nice and responsive. Unfortunately, I fear the final game will not want to make many people give them a try.